Before this game, warm up with repetition and cover pressure/cover. Play for 10-12 minutes. 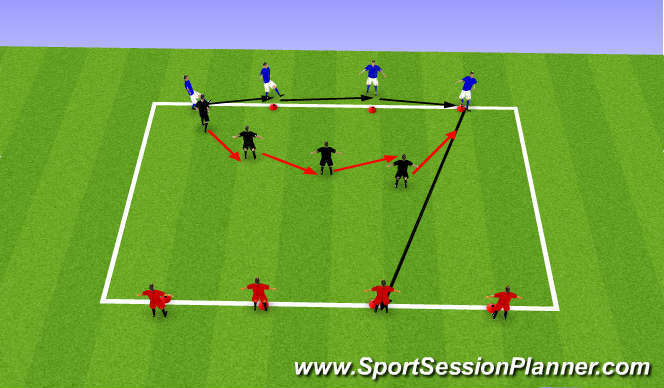 3v3 shadow defending. When wide red player has the ball, we create Pressure/Cover/Balance, cover/balance defenders slightly pinched towards ball. When center red player has the ball, Cover/Pressure/Cover - balanced cover on both sides. Defenders must stay in channels, don&apos;t try to steal the ball. Ball possessors don&apos;t penetrate, just keep posession. After 1-3 minutes, switch, repeat again. Play for 10-12 minutes total. Have these grids ready to get into right after 2v2. These six players will join another group of six players to progress to 4+4 vs. 4 defenders. 4 blues and 4 Reds keep away from 4 blacks in the middle. blacks cannot dive in and tackle the ball, but can intercept through balls. 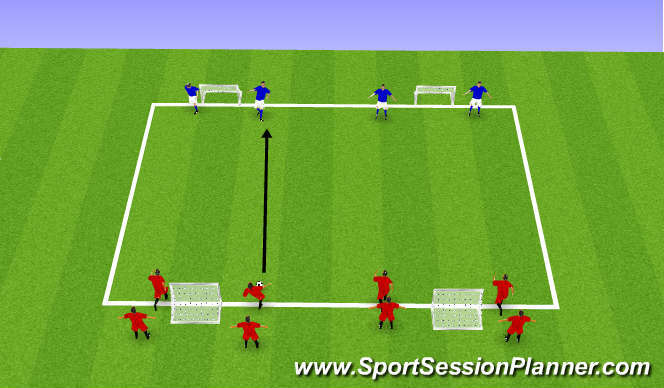 One point any time the ball is passed from side to side. Coach proper Pressure/Cover/Balance/Support, or Cover/Pressure/Cover/Balance, depending on if ball is in middle or outside. 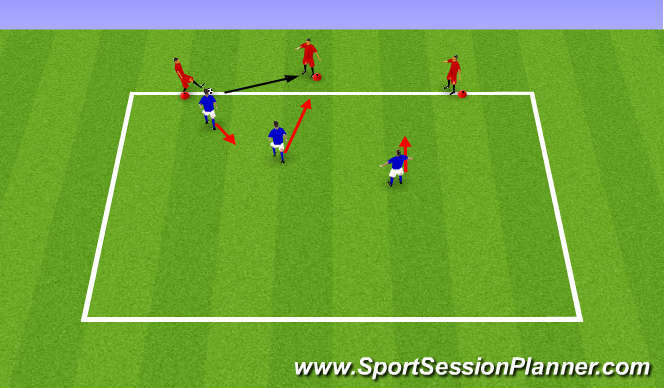 Coaching points when players are too slow to get back to proper position, or move to improper position. Play 3 games of 4 minutes - NO MORE THAN 15 minutes. Reds pass into Blues, game on to small goals. Reds can steal and counter attack. Coaching points are proper pressure/cover/balance, correct on improper positioning and too slow of speed to react. Finish with scrimmage 4v4-6v6. Play until 6:55, water while you set up scrimmage fields.